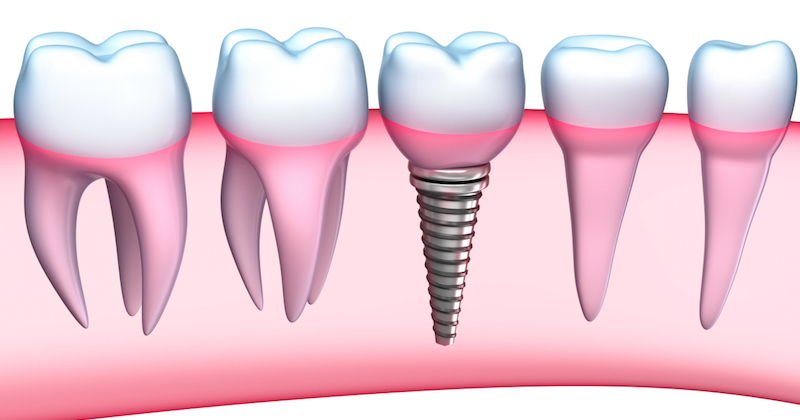 Dental implants have gained a popular reputation for their life-like appearance and longevity. Much of the latter is attributable to the titanium post imbedded in the jawbone. Because titanium has a natural affinity with bone, new cells will grow and adhere to the dental implant over time, making their connection strong and durable. Of course, to achieve that requires implant surgery — a prospect that gives many people pause before choosing this replacement option. But implant surgery is a routine undertaking, causes very little discomfort and in trained hands has a very high success rate. Here are 3 reasons why implant surgery is nothing to be nervous about. The procedure is precisely planned. Implant surgery is a relatively minor procedure, mainly because all the placement details are often mapped out ahead of time. For complex situations your dentist can use x-ray or CT imaging to determine the exact location for each implant and create a surgical guide to use during the procedure to make incisions and create the small channel that will hold the implant. Implant surgery can be performed with local anesthesia. Implantation is usually easier than tooth extraction — if you’re healthy enough for that procedure you should have no problem undergoing implant surgery. With a local anesthetic, your dentist will numb only the implant site and surrounding tissues while you remain conscious. If, however, you have any anxiety your dentist can also include a sedative or anti-anxiety medication before proceeding. There’s minimal discomfort afterward. Thanks to the pre-planned surgical guide and advanced implantation techniques, there’s very little tissue disruption and incised tissues are normally stitched with self-absorbing sutures. While some cases may require stronger pain relievers, most of the time a mild non-steroidal anti-inflammatory drug (NSAID) such as aspirin or ibuprofen is sufficient for discomfort afterward. The implant site heals fairly quickly and predictably with a 95-97% success rate. A few weeks after bone integration your dentist will attach the permanent like-like crown, and you’ll be ready for many years of full function and a confident smile.